You require highly specialized and experienced experts who know the fastest and safest way to reach the summit. And since every mountain entails different challenges, you should also assemble the best team for any IT project. We find the best-matching applicant for your project out of our pool of freelancing experts. You choose between several proposals, you meet the matching applicants and decide by yourself with whom you would like to start the project. IPSWAYS arranges the contractual regulations for you. Moreover, we ensure an equally matched applicant in case of a possible cancellation. You enjoy the maximum of project security and minimal expenditure at the same time. Your project requires staff that is fully devoted to your purpose and is available at any time? A permanent position, however, is out of the question? Then let us take care of it! We choose together with you matching applicant for your team and employ them permanently in our company. You benefit from know-how, we cover the responsibilities concerning industrial law. Through the exclusive access to acknowledged and experienced experts from IT, engineering and other fields we enable flexible and quick reactions to fluctuating commissioning and market situations. You can integrate our experts completely in your teams, you possess the same authority to issue instructions like you do towards your own employees. Since we guarantee our experts attractive conditions and non-tariff payments, you benefit from exceptionally motivated freelancers, secure your support, without contracts for work and services and you profit from the beginning on from highly specialised know-how, for instance, in terms of launching new technologies. You gain more flexibility and at the same time you minimize the risk of an undertaking and optimize your recruiting. 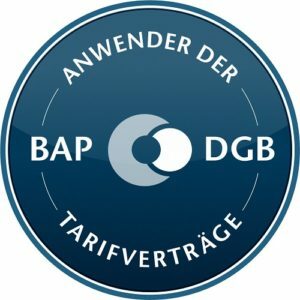 All contracts are based on the collective agreements concluded with the DGB tariff agreements, while the minimum requirements are far exceeded in most cases. When looking for suitable candidates for vacancies in your company, we are setting all wheels in motion in order to exceed possibilities of traditional personnel search. The excellent networking and industry competence of our agents help us. They know the personnel market from many years of experience, they know about salary, the usual conditions and keep constant contact to a large number of experts, candidate exchanges and partners. This excellent network makes our placement more targeted, faster and more efficient. The search for excellent leadership demands a sense of tact. We benefit from many years of experience and excellent networking in the IT and engineering industry. We find suitable candidates, contact them directly and discreetly, make a preselection regarding the qualification and readiness, and preliminary negotiate on remuneration and conditions.